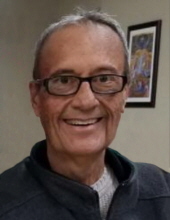 Teddy Thomas, lifelong resident of Ponca City, passed away on March 20, 2019, at Baylor Medical Center in Dallas, Texas, at the age of 59. Teddy was born on November 14, 1959 in Ponca City. Ted was the son of Melinda and Collyn Goddard and David and NaDean Thomas. Teddy’s father, Teddy Leo Barron preceded him in death when he was a young boy. Ted was raised in Ponca City and graduated from Ponca City High School in 1978. He went to work for the City of Ponca City in 1980 and enjoyed a life long career making numerous friendships along the way. He was especially attached to his “work buddies” from the Park and Rec department. They always gave him a hard time! At the age of 28, Teddy became ill and was given a second chance at life through the blessing of a liver transplant. After 31 years, his health began to decline and a second transplant was needed. However, he passed away during the second transplant surgery. Debbie and Ted met after being introduced by Debbie’s brother, Greg. He married Debbie Cremers on July 19, 1985 at St. Mary’s Catholic Church and they made their home in Ponca City. They were blessed with two children, Kara and Parker Ryan B. Thomas. Ted was an avid outdoorsman. He enjoyed hunting, especially ducks, fishing, and collecting arrowheads. He enjoyed spending time with his children, grandsons and nephews teaching them to hunt and fish and enjoy the outdoors. Recently, even though his health was declining, he was able to enjoy attending a bedlam football game watching his Oklahoma State Cowboys. He loved attending the activities of his grandchildren and all family gatherings. He will truly be missed by all. Teddy is survived by his wife, Debbie; their daughter, Kara Thomas and their son, Parker Thomas all of Ponca City. He is further survived by his five grandsons Kamden and Kolter Weatherly, Gage Barron Thomas, Trenton Lewis Holloway, and Grayson Todd Thomas. These boys were the light of his life! Teddy is also survived by his mother Melinda Goddard, and husband Collyn of Midwest City. His dad, David Thomas and wife, NaDean. His sister, Tracy Elrod, all of Ponca City. He enjoyed many family gatherings with his in laws Chris Cremers and wife Peggy, Matt Cremers and wife Martha, Greg Cremers, Julie Vap and husband Gary, Ron Cremers and wife, Michelle. He is also survived by numerous nieces, nephews and in many cases their children. He is proceeded in death by his grandparents, Bill and Ietta Cobb, his sister Teresa Jones. A Rosary will be said at 7:00 p.m. on Sunday, March 24th at Trout Funeral Home and Mass of Christian Burial will be held at 10:00 a.m. on Monday, March 25th at St. Mary’s Catholic Church in Ponca City. Paul bearers will be Parker Thomas, Ronnie Cremers, Trey Cremers, Jacob Vap, Caleb Vap, Daniel Vap, Al Payne, and Scott Jones. Honorary Paul bearers will be his grandsons, Kamden, Gage, Trenton, Kolter, and Grayson. The family will receive visitors at the home of Julie Vap and after the Rosary on Sunday evening. In lieu of flowers, the family would ask for your blessing and support of donations to St. Marys Catholic School scholarship fund or the United Organ Sharing Network. God bless the many who, like Teddy, have received the gift of life. Please consider organ donation. To send flowers or a remembrance gift to the family of Ted Thomas, please visit our Tribute Store. "Email Address" would like to share the life celebration of Ted Thomas. Click on the "link" to go to share a favorite memory or leave a condolence message for the family.